Dock jumping, the World's premier canine aquatics competition, also known as dock diving, is a canine sport where dogs compete in trying to make the longest or highest distance in to a body of water. Dock jumping events now take place all around the world ever since the sport made its debut in 1997 at the Incredible Dog Challenge - and it's making a splash here in the UK. One of the biggest organisations in the sport are DockDogs, who run over 250 events every year across the US, Canada, Australia and the UK. In the UK, it's run as a seasonal sport (dock jumping in the snow might be neither be safe or a whole lot of fun!) but in warmer climates it’s a year-round activity. So, how would you get started? It is vital to ensure that the water you are encouraging your dog to play in is clear of any danger, clear waters where you can see the floor is vital. Before you learn the training techniques for the main events you may find your dog needs to be encouraged to jump (safely) into the water. There are two main techniques that are used in Dock Dogs. The Place and Send – going the distance! This technique is used when distance is the goal, the dog is walked to the end of the dock and or, is held back while throwing the toy into the water the dog then jumps into the water to go get the toy. This is effective for dogs that are not trained to wait or stay (on the dock), especially if they have a lot of speed and can compensate for the lack of lift at the end of the dock. This technique is used to gain more distance with height, the dog is placed in a stay or wait at its starting position on the dock. The handler walks to the end of the dock holding the toy, then calls the dog and throws the toy, trying to keep the toy just in front of the dog's nose so they chase it up into the air and into the water. The goal is to use this method to get the dog at the optimum launch angle to increase distance by getting him to jump up, instead of just out or flat, as with place and send. The chase method is difficult to master. However, if your dog is toy-driven, he can be trained to follow the toy. Dock jumping is a sport where all different types of breeds enjoy taking part. Just as with canine agility, certain - athletic - breeds do particularly well. An ever-evolving sport, Dock Dogs events cater for dogs of all shapes and sizes, so they will be competing against dogs of similar size or age (for example dogs 8 years and upwards have their own 'veteran' division). Most recently in the US, the BBC filmed an event in Florida for the show 'Officially Amazing' hoping to show Guinness World Records being smashed in two fields - Extreme Vertical and Big Air. In Extreme Vertical, the high jump for dogs, the competitor gets a running start off a dock and leaps to grab a bumper extended over the water. In Big Air, the dog gets a running start off the dock and jumps as far as it can into the water. It's the handler's job to toss a toy into the water and help the dog get the best jump. Current world-record holders, Bo, a Doberman cross and current world-record holder in the Extreme Vertical at 8 feet 5 inches, and Taz, a black Labrador, the current world-record holder in Big Air of 31 feet, attended and were trying to break their own records. Here's a video tutorial about getting started in the Big Air (long distance jumping) from one of the US's leading DockDog experts, so be prepared for the Dock Dogs bug to bite if you decide to take part. 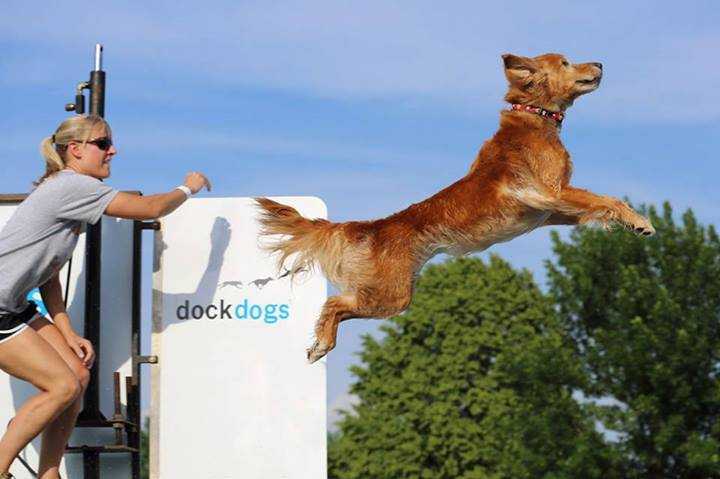 If you're interested in getting to know more about dock jumping and think you might have a canine athlete in waiting, check out www.facebook.com/dockdogsuk for safety tips and advice in getting started and upcoming shows to visit.